Opera Mint and Pavane Early Music Consort presented John Blow’s Venus and Adonis ‘a Masque for the court of King Charles II’ at a range of venues in September and October. There were four performances at Tredegar House near Newport and two in Cardiff – one at Beulah Chapel in Rhiwbina and the other at the Spit & Sawdust Skatepark in Rumney. The skatepark presented some unusual challenges, but gave Cupid the opportunity to put ‘his’ skates on. The performance was filmed by Alex Priestley and Wil Stewart. 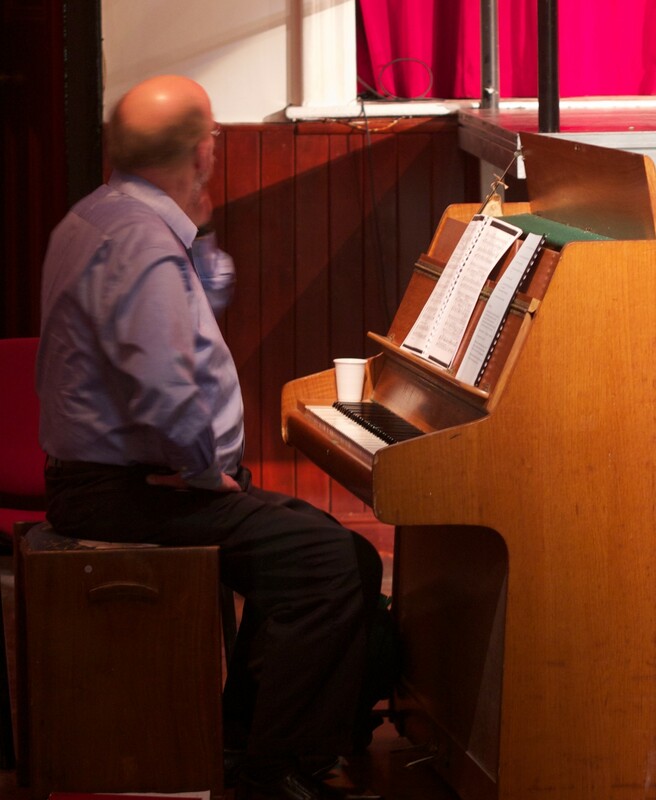 Members of Opera Mint remember with affection the pianist Steve Burges, who died in 2013. He worked with the company for many years, accompanying soloists and ensembles in concerts and opera performances. He also coached singers and taught piano. The photograph below captures his unassuming approach – he shunned the limelight but was a consummate musician. Steve was a gentle, talented and generous man and always encouraged without making a fuss. Will miss him. Steve was a true gent. Professional in every way. Rehearsals were always very efficient. No fuss, no baggage, he just got on with it! I will miss him very much, together with his subtle yet lovely sense of humour. Steve was my piano teacher for the last three years. Knowing that I could be a bit nervous playing in his presence, he always pretended to read in his diary to make me feel more at ease. It just made me laugh though, which never failed to do the trick. He was extremely reliable and even phoned to tell me when he was two minutes late. Two minutes which then had to be added to the normal time, if I wanted it or not. A bit scared of him at first, I grew to like him a lot. He had a great sense of humour, and as a true gentleman always insisted on picking up my post before he left. Steve was generous with his musical knowledge and understanding – and his time. I learned a lot from him. My impression of Steve was of a man who was patient, kind, musically-gifted and with an understated but cheeky sense of humour. Actually, in a very quiet way, he connected to the music and to all of us who were making music with him.